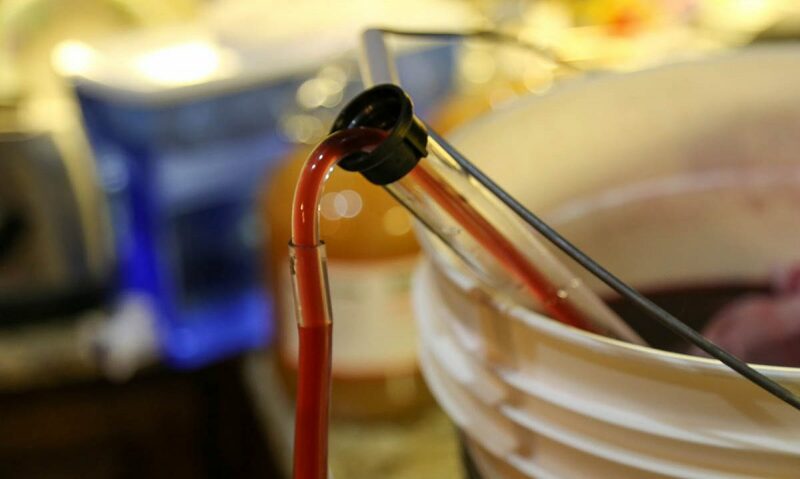 In the meantime, while watching the Yeast Pitching Experiment tail spin, I have been exploring making mead and ciders. In my small batch queue are variations on a ginger and bitter orange peel cider, the same on brett (secondary), a sour cherry cider 100% fermented on dregs from RR Temptation (Brett, Lacto, Pedio), a wine cider, and finally a show mead. It is a lot of fun to watch these and compare to normal beer fermentation… I racked several yesterday and got an initial taste. Gonna need some age on these! I also racked my “Tripel X” into secondary for bulk conditioning. This went into a modified Sanke as a bright tank, and I added priming sugar for it to carb up. Interestingly, I achieved 80% attenuation with T-58, yet yielded surprising little pepper. The beer is fairly drinkable right now – but extended aging will definitely help it mellow. At 9%, it still has a bit of ethanol burn, but I might have to rename it “Tripel IX” since I forgot the last sugar additions. Oh I put a half gallon of this onto a bit of dregs from Rodenbach Grand Cru… and it is chewing through the remaining sugars. This will go into tiny bottles – and tasted over the next year or three. Because my “Belgian” fermenter (No temp control – so room temperature) is free, I plan to put down a strong saison, with some american hop character. The conical is also free – so will look to turn an IPA around, or maybe a porter. Not clear yet. I need a good house Irish Red or hoppy American Brown recipe. I also bought some new toys, such as an oxygenation wand from Williams Brewing and a beer gun bottler from Blichman. Haven’t had the need yet to try either out. The wand will be very welcome for my inside BIAB small batches, meads and ciders. I also bought a medical O2 regulator that is adjustable between .5 and 8 liters/minute and fits my welding O2 tank. It drives my O2 stone in my ChillWizard, and will be used to good effect with that wand. AND, my bi-annual bulk hops purchase arrived and is in the freezer. Looking forward to trying Belma, Nelson Sauvin and a couple of other new-to-me hops.